When you remove Sage Accounts from your computer using Windows or a CD, certain files and folders are not automatically removed. This is because they are shared by other software and removing them has the potential to affect the other software. This article explains how to remove Sage Accounts from your computer using Windows and then manually remove files and folders that are potentially in use by other software. This completely removes Sage Accounts and can help to fix issues that persist after a standard uninstall. The article then explains how to reinstall Sage Accounts. If you simply want to remove the software quickly, just complete step 2. This will remove the Sage software but leave behind any files that could be common to other software. You must log into the computer as an administrator to run this command. Press the Windows key + R then type ODBCAD32 and click OK. 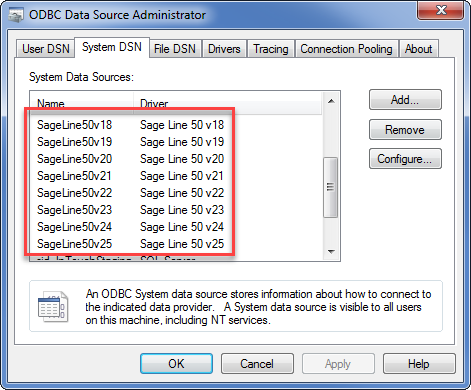 Remove any entries for Sage Line 50 within the User DSN and System DSN tabs. If the entries have been removed by the uninstall, click Next. Before you remove your software, make sure you can reinstall it. You can either reinstall from a CD or from a download. Press the Windows key + R then type Control Panel and click OK.
Click Programs and Features then find and right-click the version of Sage Accounts you want to remove then click Uninstall. Windows XP - Click Add or Remove Programs and find and select the version of Sage Accounts you want to remove then click Remove. Click Programs and Features and find and right-click the version of Sage Accounts you want to remove then click Uninstall. Deleting the following folders may prevent other Sage software from working. You may need to reinstall other Sage software after deleting the folders. Please check you can reinstall any other Sage software before following these steps. Sage 50 HR uses the following folders to store data. If you use Sage 50 HR you must ensure you have a backup of the data before you delete the folders. To delete a folder, right-click the folder you want to delete > Delete. Deleting the following files may prevent other Sage software from working. You may have to refresh other Sage software by uninstalling and reinstalling. You MUST check each file to confirm that it's a Sage file before deleting it. To check this, right-click the file > Properties > Version tab > select Company Name > confirm the company name is Sage (UK) Limited or Sage. If you are logged in as an administrator in Windows 10, Windows 8, Windows 7 or Windows Vista, you may receive Access Denied messages when trying to delete these files. In this situation you need to disable the User Account Control (UAC). For further information about this, please refer to article 15020 . UAC must be turned back on once troubleshooting is complete. If you can't turn UAC off, restart the computer in safe mode to delete the files. Click View then click Details. To see the View option, you may need to press Alt. 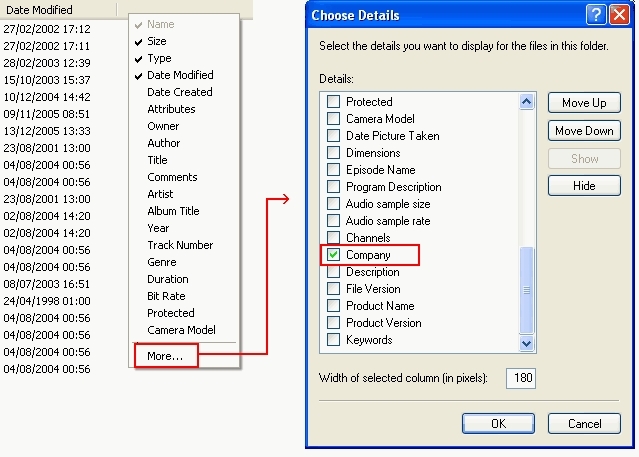 Right-click any column heading then click More and select the Company check box then click OK.
Click the Company column heading to sort the list by company. You can then delete Sage files in batches rather than individually. If you need help uninstalling .NET Framework, please contact your local IT support. Press the Windows key + R and type Control Panel then click OK.
Click Programs and Features and find and right-click the version of .NET you want to remove then click Uninstall. Windows XP - Click Add or Remove Programs and find and select the version of .NET you want to remove then click Remove. Click Uninstall then click Next and click Yes. Repeat steps 2, 3 and 4 for every version of Microsoft .NET Framework. If you are using Windows 7, you can't remove Microsoft .NET Framework 3.5 or below as it is part of the operating system. If you are using Windows Vista, you can't remove Microsoft .NET Framework 3.0 or below as it is part of the operating system. Uninstall all later versions then reinstall in the relevant order. Starting with the lowest version number, reinstall each version of .NET. You can download these from the Misc updates section of the Sage Accounts software updates article. You have now completely removed Sage Accounts from your computer. To check if the issue is resolved, reinstall the software and try to recreate it. If the issue persists, to check other causes of performance issues with Sage Accounts, please refer to article Troubleshooting Sage Accounts performance issues. If there is a problem with the installation of the software, please refer to article, Troubleshooting Sage Accounts installations.